Two shade sails in a complete kit! Install your shade sails yourself with this complete kit. It contains two sails of different shape, multiple shade sail poles, as well as the entire fixture systems adapted to your space. A special pack with 2 shade sails + the installation accessories, shade sails + the installation accessories for a design and functional installation. Pair different colors and create your custom ambiance with this 2 Acryl 300 shade sails pack. 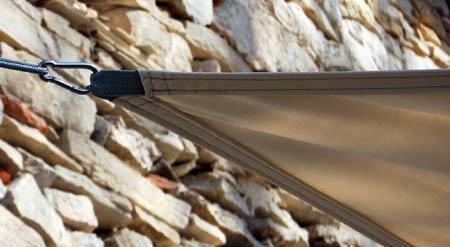 Reinforcement strap inserted in the lining of the shade sail forming a hanging strap in the corners: the tractions are distributed in the entire surface and the shade sail benefits from a better resistance. The Acryl 300 canvas has colors that resist well to light , guaranteed 5 years. Fabric composition : 100% Acrylic, water repellant canvas. Sail 2: triangle 6,40 x 5 x 4m (or 4 x 5 x 6,40m if you choose side 2: the sail dimensions stay the same but the seams are placed on the other side in order to adapt to the sail installation side). 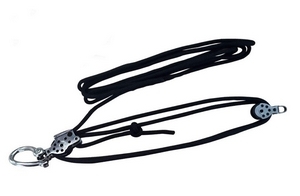 Elegant anodized aluminum poles with galvanized steel core for an optimal resistance. Removable for smart storage with an adjustable fixture height to incline the shade sail according to the sun’s position. 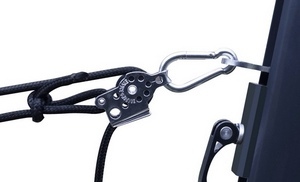 High quality nautical fixtures with stainless steel pulleys and nautical rope, giving a marine aspect to the shade sails that is visually appealing and additional ease of installation and disassembly. .
... and additional accessories such as the le adjustable pole spot or the shade sail storage bag . 2 adjustable poles with reinforced tension systems (nautical rope + stainless steel pulley), their adjusting slider and their base (to be screwed or sealed or with mural base plates). *** In the case of an installation of wall fixtures on wood, the pegs and threaded rods will be replaced by stainless steel u-shaped fixtures and screws. 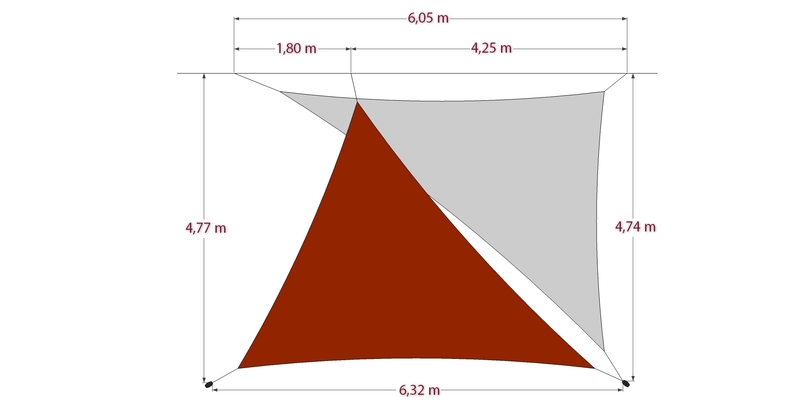 the real shade sail dimensions under tension that can be up to 3% larger than the given ones, because of the fabric stretch, the fabrication processes, and the more or less important tension given to the shade sail. The fixture points must always be situated in the continuation of the medians with a 40 cm minimum tension margin for the poles and mural fixtures. More information on the adjustable poles (to choose the base best adapted to your environment). What side should you choose ? In side 1 or side 2, the sail’s dimensions remain the same but the seams are not placed on the same side in order to adapt to the sail installation. 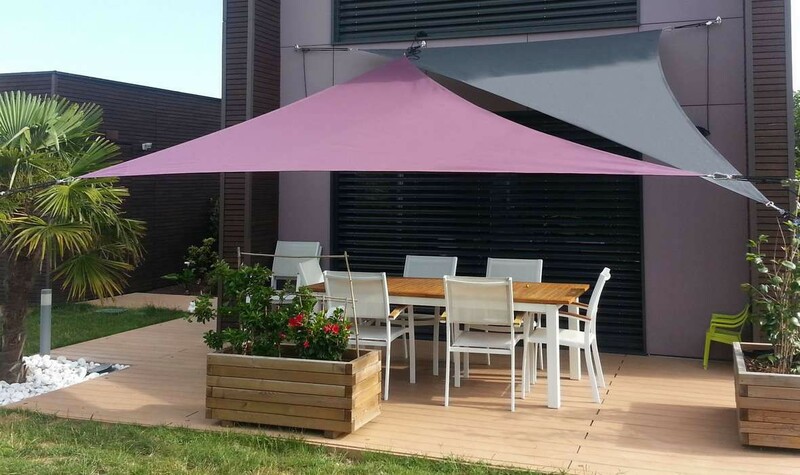 The Acryl 300 shade sails are adapted to moderate wind environments (up to 60km/h). During the installation of these water repellant shade sails, you must create a 20% incline between the different fixture points to allow the evacuation of rain water. This incline is indispensable. The Acryl 300 sails fabric are waterproof, this means that water will glide over them instead of infiltrating and passing through. This is only true if the adequate incline and tension have been created. Otherwise, a water pouch risks to form on the sail during rainfalls.